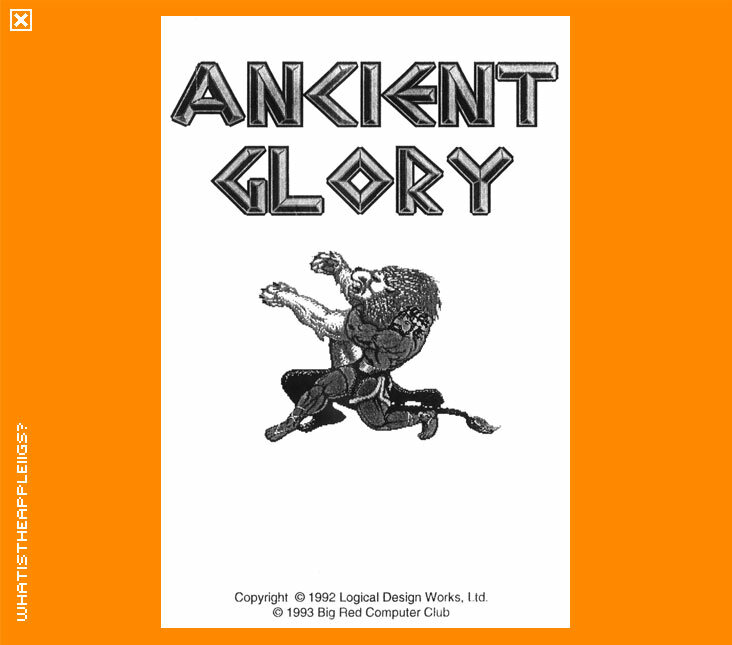 Ancient Glory was designed between California Dreams and Westwood Studios whom did quite a lot of IIGS stuff, but it doesn't appear that Ancient Glory was programmed by them for the IIGS. 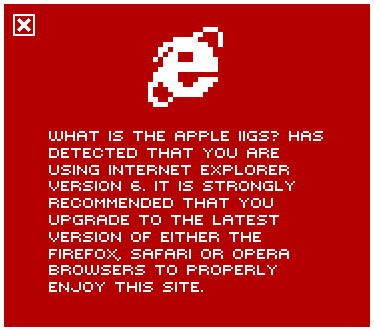 According to the About dialog, the IIgs version was done by "Some Other Guys". Very modest! At a guess, I'd say Burger Bill or possibly John Wrenholt had a hand in the IIGS version, but I could be wrong. The graphics look like they've been ported straight over from the PC version - complete with EGA colour palette. I'd class this game as an action/adventure in that quick reflexes and a trigger finger are required just as much as some trial and error and thinking about your predicament. It's quite an interesting, and at the same time, frustrating game. You are Hercules, legendary in Greek mythology for being the strongest mortal despite your father being Zeus. In Ancient Glory your task is to bring Athena the head of the Medusa, the woman with the worst hairdo in fictional history, who can turn to stone anyone with her gaze. Medusa, being the overwhelming opponent she is, will require you to collect various artifacts without which you would surely become a statue. These magical items can be found throughout Greece and beyond. Typically, to obtain each item, you must complete a quest for a particular person or god. The trick is knowing which items to go for in the right order, as you already need to have a certain item which will then help in getting another, or at least, obtaining one item can make obtaining another much easier. Because there is a particular order to get each item, this is the game's greatest challenge and at the same time, greatest annoyance. There are no save games or codes that establish you with items you've already fought long and hard for. Each time you die, you have to start again. There's also a time limit, so getting things done in the right order also has to take into account the time it takes Hercules to travel the distances over the maps. The game is played with either the keyboard or joystick. I used the joystick when I play tested the game. Open apple is your attack button, option switches between your weapons, moving up makes you jump and the rest is easy to find out. Spoiler Warning: if you're a real gung-ho gamer, then you won't want to read any of this and I must admit, it was fun figuring out this much, so don't ruin the game for yourself; use this information only if you're stuck. I've included some hints, which I've found useful in my games, which should also prove helpful to others. The game begins in Thebes, where I recommend you travel through the whole place and pick up a club. Travelling to Delphi will give you guidance on your quest from the Oracle, who will direct you to your next suitable port of call - but at the same time, be flexible to what she tells you to do. For instance, don't travel to Eleusis like she will first tell you to. First travel to Mt Erymanthus, jump a few falling rocks, club some lions and defeat another molionid (by pushing up as you swing to hit his head) and then treat yourself to a nice sword that does much more to kill the beasties than a mere club. Then travel to Eleusis to defeat the molionid there. While you're in the area, travel to Athens, where Athena will bestow you with a powerful bow and some arrows. When you leave Athena, try visiting her again whilst still in Athens - she may give you extra arrows or heal some of your wounds. If in need of further health, the springs at Thermopylae will fully restore your health, but the path is inhabited by snakes, which are difficult to kill. Jumping over them can sometimes be better, allowing for damage to be inflicted several times, as it won't matter at the end where your health is full restored. With fully restored health, travel to Nemea, where you wrestle with a large lion, its skin invulnerable from any weapon. Switch your sword off, so you're using bare hands once you reach the large lion and wrestle it to the ground. As to actually initiating the wrestle with the lion, you need to lure it into a standing attack so you can then go toe to toe with the beast and simply direction down repeatedly to make it yield (at least this worked for me in a wild thrashing of the joystick moving down in league with equally repetitive use of the fire button). With both the sword and lion's pelt for armour, you should then be ready to defeat Cerberus, the two-headed dog of Hades at Cape Taenarum. When you travel the length of Cape Taenarum you reappear at the top of the map at River Acheron, which is very useful as it would otherwise take Hercules many, many hours to travel that distance. Cerbeus doesn't have much stamina, but he moves about you quikcly, jumping around to avoid your sword slashes. It's worth moving backward and forward yourself to get into good striking distance of the multi-headed dog, and take as collateral damage any bites he inflicts upon you. As long as you have the lion's pelt, you'll survive with this strategy with enough health to spare. As you appear at the top of the map, visit Dodona, as it will wield to you some health vials and clues after you do battle with some centaurs. Visit the Oracle again for more information on the rest of your quest, who will inform you to defeat the hydra at Lerna. In Stymphalus, you'll battle with snakes and Amazon women to obtain a health vial, 10 arrows and a clue, that better stamina can be obtained at the River Acheron. Once you arrive in Lerna, you overcome snakes and bulls (snakes are best dealt with by you moving in close enough to kill them with your sword - their striking distance is longer than your arm). The Hydra itself is a harder opponent. You can use the bow and arrows to take some initial shots, but the trouble is given enough time, the hydra's heads regnerate even after you cut them off, so you have decapitate each of them quickly. You'll need to reposition yourself to length of your sword aim to effectively sever each one. If you fancy leaving Greece, you can sail from Pylos, but first you'll need to defeat two harpies, who guard the way onto the boat. Sailing to Cnossus, you'll be greated by a minotaur - I don't recommend you take him on unless you've got full health.